Note: Opening up your H4n probably voids the warranty, plus it's possible to accidentally break or lose some of the parts, as well as damaging the circuitry. If your H4n is under warranty, think twice about opening it. If you proceed, it's entire at your own risk. Note: The electronic circuitry can be damaged by static electricity. Before touching or handling the circuit boards, touch some grounded metal parts inside the case, such as the copper foil shielding the combo jacks, or the metal body of the built-in mic assembly, or the gold-colored end of the 1/8" stereo minijack in the back of the mic assembly. Handle the circuit boards only by the edges, be careful not to scratch the wiring traces, and try not to touch the components or the traces. Note: When you remove multiple screws in one disassembly step, as you remove each screw, immediately check to see if it is the same length and type as the other screws. If not, write down the differences and make a note which holes they came from. Some screws can seem similar but are of different lengths, and you must put them back in the right holes. Tools needed (see photo below): Small phillips and slotted screwdrivers, needle-nose pliers (equivalent to "jewelers" tools). You MUST use high-quality tools of the proper size, otherwise you can strip the screw heads. - Remove the battery compartment cover and remove the batteries. - Remove the SD memory card. - On the back of the unit, remove the three small rubber plugs from screw holes. Remove the screws from those three holes, plus from the two other holes at the bottom of the case. Note that one screw is longer than the others. - Pop open the plastic back cover of the H4n, this is the part that comes off first. Do NOT try to remove the front cover, and don't even allow it to flex as it is still attached by screws that can only be accessed from inside the unit. To remove the back cover, insert a small slotted screwdriver blade in the seam between the side panel insert and the back cover where shown (see photo below) and twist the screwdriver to pop open the detent. Do this on each side. - Carefully lift off the back cover but note that it will remain attached by some wires (see photo below). Write down the details of how the wires are routed and how and where the connectors are attached. Then use needle-nose pliers to unplug the connectors. Don't pull on the wires, pull on the connector body. If necessary, use a small slotted screwdriver to pry the connectors loose. - Note the small plastic slider on top of the Stamina switch. Observe how it sits on top of the switch with the switch tang in the hole on the bottom of the slider, then remove the plastic slider so it doesn't fall off and get lost. - Remove the four small black screws from the back of the built-in mic assembly, note which holes they came from because there are three different sizes. - Observe the small flat cable attached to the mic assembly circuit board. You must remove this flat cable from the connector on the mic assembly circuit board before you can remove the main circuit boards. Note that there are two small brown retainer tabs, one on each side of the connector body. Using a small slotted screwdriver blade, pry the brown retainer tabs out from the connector body (see photo below). The brown tabs don't come off the connector body, just move them away about 1 mm, a little at a time, equally for each side. In the picture below, they are about halfway done. Then gently grab the flat cable with needle-nose pliers and unplug it from the connector. Done properly, the flat cable unplugs without any force at all, so if it resists, the retainer tabs are not out far enough. - Remove the two shiny screws that hold the mic assembly to the circuit boards, then detach the mic assembly and set it aside. - Like you did before, pop off the front cover of the H4n by inserting a small slotted screwdriver blade in the seam between the side panel insert and the front cover and twisting the screwdriver to pop open the detent. Do this on each side. - Holding the unit by the side panel inserts, lift the "guts" out of the front cover and put them down gently (see photo below). Note that the LCD screen will be hanging by its wires, so do this step gently. Avoid scratching the front of the LCD, plus don't get dust or fingerprints on the LCD or the inside of the front window. - On my unit, the Record button wasn't attached to the front cover, so it can fall out of its hole in the front cover. The other buttons seemed to be attached to the cover. - Before you take the side panel inserts off, closely observe how they hold the stack of circuit boards together, plus how they align with the pushbutton switches on the edges of the circuit boards. Note that the On/Off switch has a separate plastic slider, similar to the Stamina switch, except that it is attached to the side panel and won't fall off. This slider has a notch that mates with a tang on the actual switch. - The stack of three main circuit boards is held together by two small mating connectors, one between the center board and the top small board, and one between the center board and the bottom LCD board. You can separate the boards by gently pulling them apart. Don't twist them or wiggle them, just pull them apart vertically. There seems to be another mating connector between the main board and the combo jack board, but I did not separate those boards because it seemed like there might be other things holding them together. 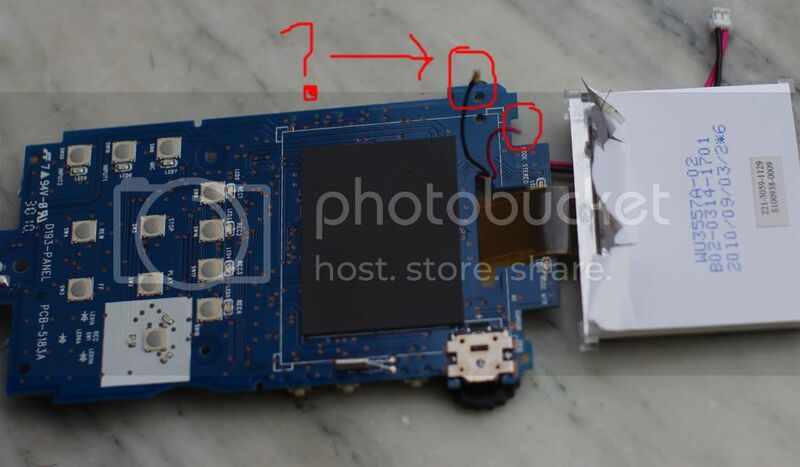 - You can take the metal cover off the SD card assembly to better see what's underneath, but BEWARE, some parts will fall out including a tiny piece of stiff wire. This is the piece that makes the card latch and unlatch as you push it into the holder. It took me a while to figure out where the wire went, and without it, the card will not stay latched in the holder. - Reassembly is the reverse of disassembly. Be sure to properly locate the side panel inserts on each side of the circuit board stack before placing the guts in the front cover (you can't fit the panels in afterwards). As you put the one side panel on, be sure you properly mate the notch on the plastic slider with the tang on the On/Off switch. Make sure the Record button is fully inserted into its front cover hole. Be sure the LCD and window are clean, and as you place the guts into the front cover, be sure the LCD sits squarely in the window area of the front cover. Remember to snap the detents closed to hold the side panels in place. Remember to properly mate the plastic slider on the Stamina switch. When inserting and tightening screws, try to carefully re-engage the existing threads so you don't cross-thread the screws. You can do this by putting a screw into its hole, then slowly turning it backwards (as if to loosen it) until you feel the threads drop into place, then turning it the correct way. Don't over-tighten the screws, secure them well but remember these are tiny parts and a little torque goes a long way. - After reassembly, you will probably have to reset the date and time, since the batteries were removed for a while. Then, make a test recording in stereo mode and play it back to make sure everything still works. Very kind of you to go to the trouble to document that so well. Thanks. Thanks, John! Very nice job! I'm glad you found it useful, and I'm glad you got the static to go away. Whatever you did, it was exactly the right thing. Great job with this, very detailed and much appreciated. One exception from the post: just touching the metal inside the unit will not discharge static electricity because the unit itself is not at ground potential. The best way is to stick a small Philips screwdriver in the ground hole of an electrical outlet, and touch this. I wear a metal watch band and have a long wire with alligator clips attached so that I am continually grounded whenever I work on computers, electronics, etc. Just moving around on carpeting, etc can generate a very large static voltage that can damage a cpu. The reason I suggested touching bare metal inside the unit is to equalize the voltage between yourself and the rest of the unit. It's true that you may still have some static charge with respect to an earth ground. But it's the voltage difference between yourself and the unit that may damage the circuitry inside the unit, and by touching the metal, you equalize the voltage. Your way would work but I would feel a little safer if there was a fairly high value resistor inline with your ground wire. When working on circuitry, there's a possibility you might accidentally touch some live circuitry that is referenced to earth ground. Even low voltage is enough to cause a shock risk if it goes in one hand, through your heart, and out the other hand to a low-impedance earth ground. It's better to have a resistor in the ground path to limit the accidental current to a value that is not at all dangerous. The resistor still allows a static charge to dissipate. sorry for my English, my "zoom H4N" fell, I opened it and there are two cables that I do not know where to put, thank you in advance for your help. Here are a few pictures of how the wires attach to the LCD panel. This looks like a difficult repair if the tabs have broken off. Click where indicated to see a bigger picture in a new window. Click this link for a bigger picture. I'm glad I found this post. While using the H4n with headphones in, to monitor the sound, the unit was dropped. Guess what? The headphone jack stopped working properly. The signal was coming in intermittently as if there was a short. And wiggling the connection only strengthened my suspicion. So I found this page and disassembled my recorder. I found that the headphone jack was cracked and therefore the headphones didn't engage all the metal connections. So I called Samsontech (the USA distributor) and they said they had the part and would mail it to me for free! Can you believe that? So, I will find a soldering gun and fix it when it comes in. The part has three contacts that solder onto the board. I'm sure it will be difficult due to its size. But at least I'll have my H4n working again. here is a picture of the part. This information is rely good, but I miss something. The first time I open it, I didnt touch anything. ater, the static was there, but I can heard the sound of the mic (whit static). So the second time I open it again, I try to play with the ribbon cable (flat cable?)... but after that I return to the firt place and I only heard static noise in my right. If not. I will just buy a good shotgun mic. Hello! I have a question regarding some parts inside the H4n. So I tried opening up my H4n because I had a problem with one of my XLR/TRS inputs (input 1). For some reason, during a recording session before, it just suddenly conked out on me. In numerous other instances that I tried to see if it worked again, I found that there was still some signal coming in, but very very low. Even if my recording level was on 100, the signal was barely audible. It would peak somewhere below -48db on the meters. Now I tried opening it up to see if there was something obvious. What I found was that the two wires (black and red) connected to the board where the input jacks are were disconnected. My question is: are they related to my issue regarding the XLR/TRS input? If not, what do they do? Because everything works fine except for my original problem. Help is much appreciated. Thank you! This an old post but as I recently had the same problem I now post my fix. My thanks for the breakdown details. After main body dis-assembly I stripped out the built-in mics by carefully prising them at the end of their housings. (Note when reassembling there is a tiny locating notch so that the rotational angle is maintained) I then unsoldered, desoldered cut then remade all 12 mic cable connections. I then resoldered all of the joints of the rear 1/8" connector. I cleaned the mic ribbon cable ends with isopropyl alcohol and reinserted. If you are going to attempt this get a good pair of precision tweezers to hold the fine wires as well as a scalpel blade to carefully ring the insulation for pulling off with your fingernails. After reassembling the static noise had gone and in fact the H4n appears to be less noisy than when it was new. Would just like to say that this is a very nice document. I'm thinking of opening up two H4ns in order to swap some parts and hopefully get one fully working machine, and this actually makes it seem feasible.